Few genres are more controversial among metal fans than deathcore. Many aspects of the genre are mocked and questioned, from the musicians' unconventional fashion for ear gauges to their extreme "pig squeal" vocals. Many people do not even consider deathcore to be metal at all, resulting in transcendental progressive metal bands like Between the Buried and Me and Emmure being removed from this site. The core of this dispute, I think, comes from the relative merits of riffs and chugs. Traditional metal fans idolise the riff, considering it the core of true metal. This was indeed the case for the first few decades of metal's history, but, since the 1990s, chugs have become increasingly prominent. Bands like Suffocation and Pantera experimented with heavy use of breakdowns, some of which involved chugs, but the art of the chug was not really mastered until the emergence of nu-metal and its spiritual successor, deathcore. This EP, as the defining release of the deathcore movement, is a perfect microcosm of the impact of the genre. Other bands like Whitechapel and Carnifex were also considered part of this movement; why an obscure French progressive metal band and Finnish death metal band were described as such is anyone's guess. Regardless of the accuracy of those genre classifications, there is little doubt that Doom represents deathcore at its best. The EP features powerful riffs from guitarists Andrew Arcurio and Ravi Bhadriraju, backed up by Brent Riggs' bass and Elliott Sellers' syncopated drumming. Vocalist Jonny Davy squeals some of the most brutal vocals ever recorded, recalling the vivid sounds of a gurgling river dredger and a live pig being stuffed into a wood chipper. The lyrics, concerning loss and devastation, give additional impact to the songs if the listener reads them; unfortunately, the MySpace teenagers who made up most of the band's audience mostly did not. But it is in the heart of deathcore, the breakdown, that the climax of the EP is felt. As the beat slows to a steady plod and the guitars chug, with intense squealing soaring above them, the brutality is simply unrivalled in the prior history of metal. Immolation and Suffocation strove to achieve this level of heaviness, but could not; even the great Cryptopsy did not achieve it until The Unspoken King, a record heavily influenced by this EP. Here, we see the final triumph of the chug over the riff. Riffs were great in their day, but the future lies with chugs, however much traditional metal fans may deny it. The sooner we see death metal bands eschewing the riff and embracing the chug, the sooner we shall see unprecedented heights of brutality in extreme music. Choosing a standout track is a difficult task when considering such a sublime work of art, but the second track, "Entombment of a Machine", would be my choice. The song epitomises Job For A Cowboy's early sound, with intense riffs followed by a breakdown so powerful as to make Effigy of the Forgotten sound like middle of the road pop music. It makes the listener want to flail his limbs around wildly without regard for anyone else in the vicinity, as many deathcore fans do. If you cannot appreciate the majesty of this song, and this EP in general, you are simply, like Jethro Tull, living in the past. 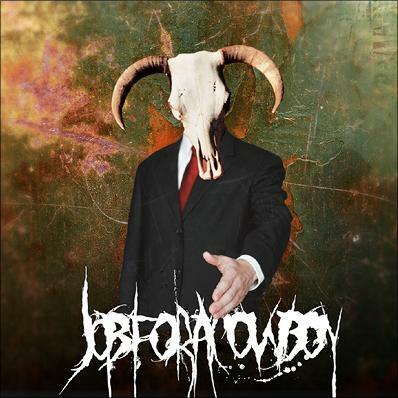 Job For A Cowboy would unfortunately later move away from their pioneering early sound, focusing more on traditional death metal riffs and placing less emphasis on chugs. It seems likely that they felt pressured to "sell out" and become more traditional to appease the metal fans who disapproved of their groundbreaking approach. Whatever the reason, they have still left us with a tantalising glimpse of what extreme metal should be, and what it can be in future if only people dare to embrace the chug.